There is nothing that can equal the joy of having your friends over for a fun-filled afternoon. Kitty parties are a common practice amongst ladies all over the world. Friends decide on a convenient date and get together at one person’s place, to enjoy delicious food and play games. It is a great opportunity for women to swap recipes and learn new skills like crochet or embroidery together with friends they are comfortable with. Usually kitty parties are organized once a month or once in 15 days. While friends have now begun to meet each other at restaurants and party halls, in proper kitty party culture, the parties are usually held at somebody’s home because that comfortable home atmosphere is what makes it so much fun. While some people prefer to order food from a caterer, most women still prefer home-cooked treats for kitty parties because that is part of the fun! 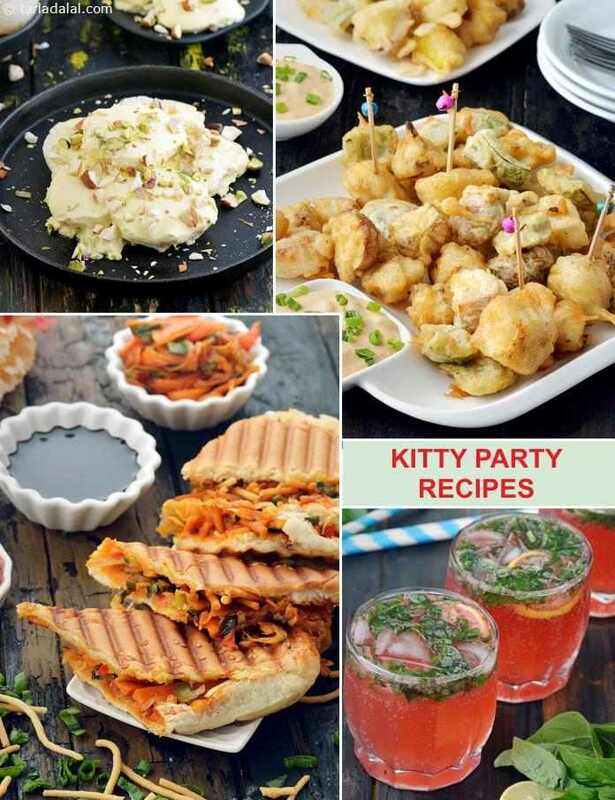 It is a time to show off your cooking skills and share easy kitty party recipes and quick kitty party recipes with friends. Sometimes, the host prepares all the required food with one or two friends popping in earlier to help. At other times, the party might be organized as a pot-luck, where each friend cooks and brings some sweets, sandwiches, snacks and drinks from their home. If you are organizing a kitty party, then it is preferable to select dishes that are easy, tasty and filling so you can cook them fast and then focus on other preparations and spending time with friends. Sometimes, you can also use this opportunity to team up with close friends and try out some challenging recipe! We have put together a range of recipes that you can prepare when you invite your friends over for a Indian kitty party. We have chosen stuff that is out of the ordinary, such as the Moong Sprouts and Potato Salli Chaat and Paan ki Chaat to Kalmi Vada. We have also picked some international exotics like the Queso Dip, Ricotta and Cherry Tomato Crostini and the Banoffee Pie, so that your friends can relish something out of the ordinary, and will have something great to talk about till the next party! Tarla Dalal Hi Rachael, Our website mainly concentrates on Vegetarian Indian and international cuisine. You can scroll through it to find different recipes across different sections. Do try them and share with us your feedback. Happy Cooking!